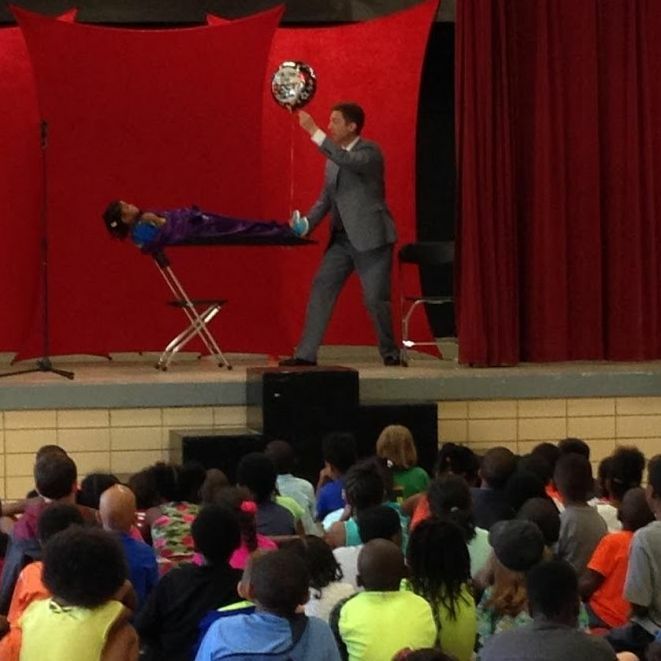 Atlanta magician Joe M. Turner performs an illusion for a rapt audience in Tucker on June 3, 2015. The cast of the All-Star Atlanta Magicians Show: MC Dale Adamson with Paul Sponaugle, Merritt Ambrose, Debbie Leifer, and Joe M. Turner. (plus another half-dozen in crew and backstage support) in a community relations effort on behalf of the Georgia Magic Club, Ring 9 of the International Brotherhood of Magicians. On Wednesday, June 3, members of IBM Ring 9 – The Georgia Magic Club produced an all-star magic show for the students attending DeKalb County’s “Camp Superstars” at the Tucker Recreational Center in Tucker, Georgia. The performers included Paul Sponaugle, Merritt Ambrose, Debbie Leifer, and myself, with current Ring 9 president Dale Adamson serving as master of ceremonies. I was honored to be asked to be the closer on a show in which all the performers and the MC had been voted “Greater Atlanta Magician of the Year” at least once, and in some cases multiple times. Ring 9 members West Evans, Mike Dunagan, Martin Baratz, Gene Hendrix, Dan Garrett, and Jim Mangham served as the technical and stage crew for the show, and current Ring 9 Vice President Mark Hatfield was the producer. Atlanta magician Joe M. Turner performs a trick for a young camper in Tucker on June 3, 2015. Every performer brought something special and unique to the show. Paul Sponaugle has an engaging wit and impeccable comic timing, and he interacted perfectly with his chosen volunteer in a magical torn and restored paper routine. Merritt Ambrose performed a classic broken and restored balloon string trick, and finished by making his table float in the air. Debbie Leifer delivered a strong presentation which climaxed with the continuous production of coins from the air, during which she was assisted by a youngster whose reactions were as magical as the trick itself. During my own segment, I got some terrific screams by causing the audience to see my head shrinking and growing in a strange optical illusion. After some comedy balloon sculptures, I caused a young boy’s signed playing card to vanish while he was holding the deck of cards, only to appear in a previously inflated and tied balloon. I then closed the show with a classical stage illusion in which a young girl is suspended in the air between two chairs. 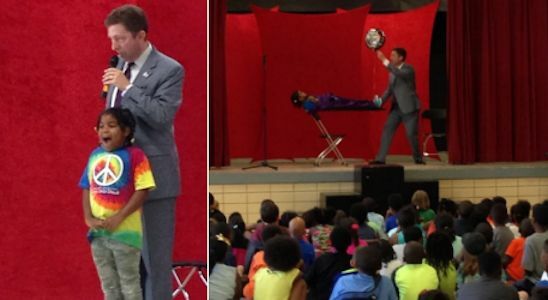 The program, which entertained somewhere on the order of 250 kids aged 5-15 (plus at least a dozen adults), was not just a great way to engage and support activities in the greater Atlanta community, but also a way for Ring 9 to progress toward award status within the International Brotherhood of Magicians. “Honor Rings” are designated by the international organization for chapters, or Rings, which attain specific membership and programming criteria. 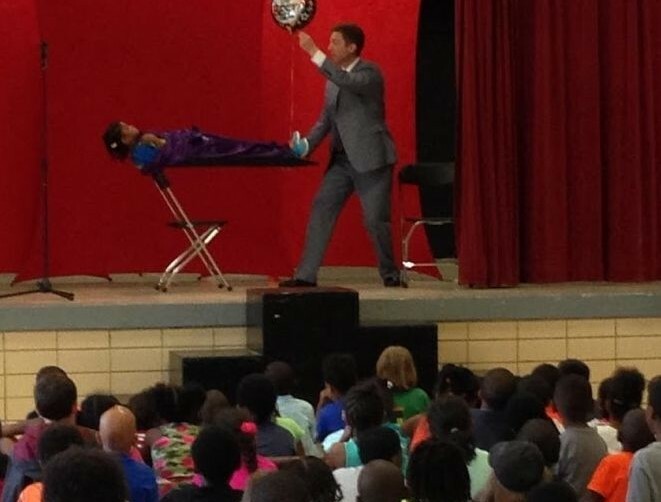 Atlanta magician Joe M. Turner performs a magical levitation with a volunteer on June 3, 2015. I am thrilled to be part of Ring 9, the Georgia Magic Club. I served as Ring president in 2000 and 2001 – just a few years after joining the club in 1998 – and I have been an active board member for most of the years since. I can easily assert that I would not have the career I have now, nor would I have pursued leadership roles at the international level, without the support and encouragement of so many of the members of IBM Ring 9. While performances for children’s groups are not my primary market, I considered it a privilege (as well as a lot of fun!) to participate in this project. I thank Ring 9 vice president Mark Hatfield for inviting me to be part of the show, and congratulations to the cast and crew on a job well done!